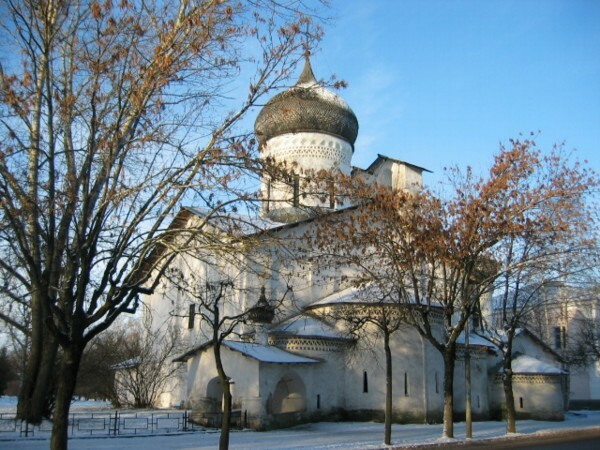 ﻿ Pskov city, Churches and chapels. History, monasteries and architecture. Hotels and museums of old Pskov city, Russia. Chapels. Russian. Russian city Pskov has celebrated 1 100 year jubilee, in 2003 year. An ancient Pskov lies in the Pskov Region in the northwest of Russia, on a hill between the Velikaya and Pskova rivers rises. The first photo is Photo of Virgin Korsunskaya Chapel - it was built in 1929 year in Izborsk village, 32 km from Pskov city. The small in volume, it is exceptionally proportional, slender and harmonizing with surrounding space. The Pskov chapels not only replaced churches in poor villages, served as markers on roads, and indicated halting points. They also served as places of repose for the dead before burial. This was a very wise decision, for many peasant houses in those distant times had only one room where the family lived. In the chapel the dead could lie in solemn and appropriate surroundings. On second photo little chapel built into St. Nicholas Church. Pskov breath the warmth and richness of this small, simple construction. The chapel is like a small porch attached to the side of the sanctuary arse. Anastasiya Chapel. St. Anastasia's Chapel was built in 1911, to replace ancient chapel of 1711.Architect is Shchusev. St. Anastasia Chapel located on the bank Velikaya river, opposite Kremlin, near with Dormition (Assumption) by the Ferry church. Inside the chapel are frescoes. Nativity of the Christ Chapel. Nativity of the Christ Chapel - was built in 2003 year in Pskov city, near railway station. St. Olga Chapel, which was built in 2000 year in Pskov city, on the bank Velikaya river, opposite Kremlin, near with Dormition (Assumption) by the Ferry church, not too far from St. Anastasia's Chapel. Virgin Derzhavnaya Chapel. 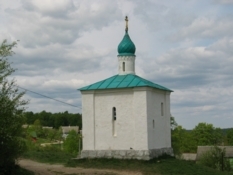 Virgin Derzhavnaya Chapel - was built in 1993 year in Pskov city, near St. A. Nevsky military church.